Amood board captures emotion. It conveys a feeling. And thanks to technology, it’s easier than ever to create a mood boards for your video project. In this post, we’re breaking down the best digital mood board apps, mood board software, and examples. Plus we’ll provide you with a bunch of mood board templates for free. Also known as an idea board or theme board, a moodboard is a collage of your images that inspire you for your film, television pilot, graphic design agency, fashion ideas. It’s the first step before preparing a storyboard and shot list. It’s also important to send to clients before they commission work. You may have great ideas, but if your client doesn’t see what you see, it’s all for naught. GoMoodboard is one of the most popular online mood board apps. With no account required, the answer to ‘how to create a mood board’ is simply click and drag images onto your project. Whipping up an idea board is just a matter of finding images you need for your production from your breakdown sheet. 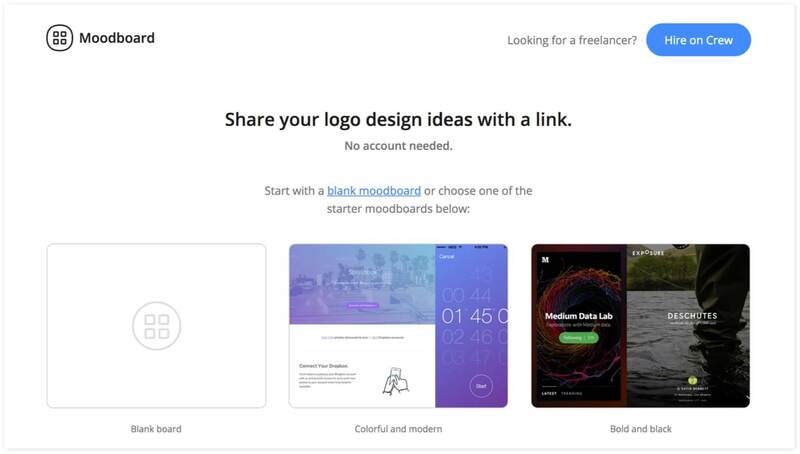 If you’re looking to send mood boards to clients and/or creatives for input, GoMoodboard may not be the free answer you were looking for. While easy to create, their online mood boards can’t be sent around and annotated for revisions and new ideas. StudioBinder’s mood board template is the only one you need for production-needs. While the other mood board creation tools listed on this list have strengths in fashion, graphic design, and interior design, our mood board template is formatted exclusively for video and photo content. With space for characters, locations, costumes, props, etc and a sleek design, once you get a approval from your clients, you’re ready to generate a shot list and storyboard. Download your FREE ​mood board template for video production below. Crafting a mood board with a team? Then, MURAL is your answer. Taking full advantage of the digital space, Mural offers an array of options for collaborating on a mood board online. Drag images in real-time, start polls, and design mood boards together. Launched in 2010, Pinterest quickly introduced digital mood boards to general public. While most people use Pinterest to show their dream kitchen ideas to their neighbors, it’s still a powerful mood board maker for production needs. As you design inspiration boards for your own production, Pinterest is a great place to find inspiration. Chock full of mood board examples for film, television, and interior design, Pinterest is a great place to find a mood board example for just about anything. And for the price of zero dollars, anyone can be a mood board creator. Brainstorming costume ideas for a film? Maybe you’re rolling out a clothing line. Maybe you’re a photographer preparing for a shoot. In any case, you’ll definitely want to check out Polyvore when creating fashion mood boards. Sourcing its library from clothing sites, you can easily enter a keyword and instantly find shoes, tops, bottoms, and everything in between. It comes loaded with mood board templates, perfect for photographers looking to whip up something on the fly. Created by ZURB, PatternTap isn’t the best for production, television, or even fashion mood boards. It is great, however, for the distribution end of a production. Specializing in moodboards for websites, you can easily brainstorm ideas for your project’s release website which you’ll need to add onto your EPK (Electronic Press Kit). WHAT COMES AFTER YOU MAKE A MOOD BOARD? Once you’ve laid out your general ideas into images, it’s time to make a storyboard and shot list. While your storyboard will fine tune the visuals, your shot list will provide a technical list of what you need to shoot for your crew. While storyboarding usually comes before your shot list, you don’t have to choose in StudioBinder. Easily break down your script into shots, which automatically convert into storyboard frames and a slideshow you can send directly to clients. Evernote is the popular cloud-based app that many use for note-taking. It can also be a powerful mood board creator. By opening a new note, you can easily drag and add images for your moodboard that can be viewed on your phone, tablet, or browser. Evernote is ideal for filmmakers and agencies who like to have all of their ideas in one place. But at that point, you may want to upgrade to production management software that stores your contacts, script drafts, and breakdowns in one place. Featuring curated images from filmmakers, commercial directors, and agencies, it’s a great place to find a mood board example for your production. You can easily search mood boards by short film, commercial, photography, feature, you name it. Okay, maybe he didn’t say that. But he did kill a guy. How to make a mood board online? Do you select images and then add them in? Do you search an existing library? 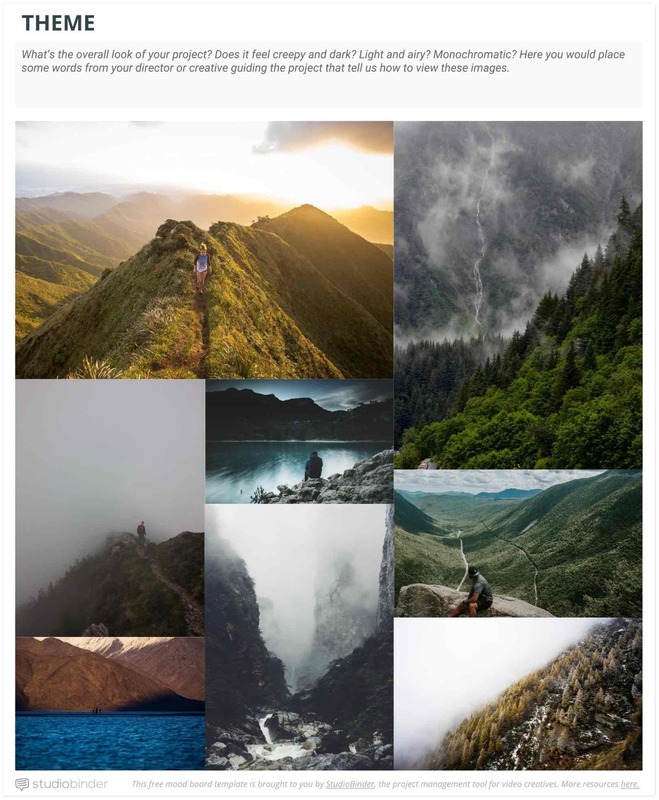 In Canva, you don’t have to choose. Tailored for brand mood boards, Canva is the one stop place for commercial makers and agencies tinkering with a creative brief template. Canva offers plenty of mood board templates for its price tag, but can you put a price on an idea? If you’re producing a video for a client, one of the first things you’ll do is submit a creative brief. A creative brief is essentially a proposal for work, outlining your vision. In that vein, a brand mood board gives your client the clearest idea of what you’re thinking. To get started on yours, check out our free creative brief template formatted for video agencies. Gimme Bar isn’t exactly a mood board app, but it certainly is a great mood board asset collector. Functioning as plug-in on your browser, Gimme Bar allows you to drag videos, images, tweets, etc. from the web storing it in one easy to find place. While not great for laying out a digital mood board, it certainly comes in handy in the early stages of collecting images as you feverishly re-read your script and cross check your script breakdown. DOWNLOAD STUDIOBINDER'S FREE MOOD BOARD TEMPLATE RIGHT BELOW. Olioboard is perfect for nailing what you want a set to look like. Primarily marketing itself as a mood board for interior design, it allows you to brainstorm set ideas in either a 2D or 3D space. This digital mood board app pulls its selection of furniture and set dressing options from the top shopping sites. In that vein, filmmakers use Olioboard strictly as an idea board, because who has 3,000 for a wooden chair a set dresser can make for minimum wage. Got a great script? Already picturing the first and last shots? Got an iPad? Moodboard turns layouting images into a methodical process. With pretty stringent mood board templates installed, it does have the quality of scrapbooking to it. It’s also only available in the United Kingdom. Apologies in advance, Yankee friends. While primarily a workflow management tool for designers, InVision offers a mood board function that’s sleek as it is intuitive. Known as just “Boards,” InVision spans over the cloud, allowing you to change and view digital mood boards on smartphones, tablets, and desktops. You may be thinking a mood board app this good can’t be free. And you’re right. Pricing for InVision can run you up to $100 per month, based on the features you select, the number of teammates you add, and how many mood boards you create. Want to know how to make mood boards in one minute? By using Niice’s Chrome extension, you can easily store images as you surf the web, which appear on your Niice account. This digital mood board app ain’t cheap though. Running $45/month, its features and ability to create an unlimited amount of boards hopefully make up for it. If you’re looking for a free mood board template made exclusively for video production, look no further. Already broken down into the major elements you’d need for a commercial, feature, or branded content video, you simply drag your images. You can easily print as a PDF. But don’t forget to store your mood board online. While we’ve laid down a list of mood board software and tools to use on your next production, it’s important to note that an idea board is only as good as the ideas you populate it with. It’s important to keep your breakdown sheet and shot list close by as you make your mood boards. Don’t just study mood board examples on Pinterest and hope inspiration will strike. Learn how to create a mood board for each element of your production by closing this window, grabbing a template, and working. What mood board app is missing from our list? Let us know in the comments. Wow, these mood board apps are awesome. Loads of thanks for providing an article with such beautiful content.